Join us for First Mondays! The Coller Rare Book Reading Room captured by Ardon Bar-Hama. Come visit The Drs. Barry and Bobbi Coller Rare Book Reading Room for an hour on the first Monday of each month (excluding holidays). Library staff will show a selection of treasures from our collections. We will begin in the Academy lobby at noon (1216 Fifth Avenue at 103rd Street). No advance sign-up is required. 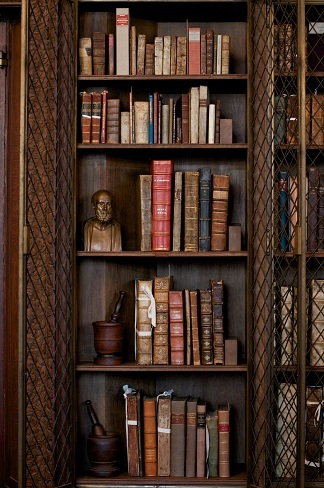 Our rare book room was built in 1933. A 2014 renovation restored the room’s historic windows, period cork floor, and unique light fixtures, bookishly designed to feature early modern printing devices. Please note that The Drs. Barry and Bobbi Coller Rare Book Reading Room is also open to researchers by appointment on Tuesdays, Thursdays and Fridays from 10am– 4:45pm and Wednesdays from 10am– 6:45 pm. Email us at library@nyam.org or call 212-822-7315 to make an appointment. Our next First Monday is October 5. Hope to see you there! This entry was posted in Announcements, Collections, Events and tagged Drs. Barry and Bobbi Coller Rare Book Reading Room, First Mondays by nyamhistorymed. Bookmark the permalink.